I'd love to use this program, but with both 1.0 and 1.1, I start it up, it appears, but then just gives me an hourglass cursor over both windows and becomes unresponsive. - DVD Decrypter works great with the default SPTI. 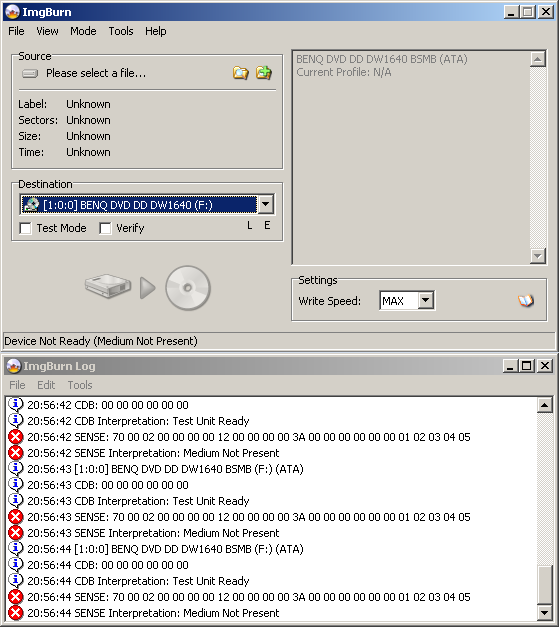 - The log seems to get as far as DVD Decrypter (Found 1 DVD-ROM and 1 DVD?RW!). - I tried some registry values to switch it to Nero ASPI, all the same problems occur with a slightly different log. Ah just saw your post over at cdfreaks and I was gonna reply to it but the site seems to have gone down for me. That's a really weird place for it to get stuck, yeah you can easily enable I/O debug mode at this point - press F8 as soon as the program starts to load. Then just copy + paste the log. If you can't copy + paste, try and copy out the last few lines. The message in the status bar is often helpful too. Okay, since I can't select anything from the status window, here's a screenshot for ya. It repeats those last five lines over and over. And to answer a couple things, I'm running Windows XP and have an Alcohol 120% virtual drive enabled. Ok - I am not the best at this but what exactly are you trying to do ? I would guess that "Medium Not Present" means that there is no disc in your drive...... thats when I have seen that message, either that or your drive is playing silly buggers. lol yeah, that's what's supposed to happen! The program appears to be working just fine. You put your disc in, select your image and then click on the big 'Write' button. Couldn't you automate that in the next version LUK ? It looks okay there, but clicking on it at all gets me the nasty, unresponsive program things, like the menu bars turning completely white and Windows reporting it as unresponsive. I just did that, and took a screenshot, and was typing this up, when it eventually popped up, all nice and responsive! Now it's instantly responsive every time I start it, hurray! I wonder what the heck made it go unresponsive for that long, then start working. Not much goes on inside the main thread besides the drawing of stuff and so there should never be anything that takes AAAAAAAges to complete - before then allowing then next paint message to be processed. All the I/O stuff is done in threads (well, most of it).